I know that it is called the greatest Jack-of-the Month, but when you have two amazing Jack Russell's who each is unique in their own way,there is no way I can choose between the two! Meet Rocky (1yr old). At typical,energetic Jack Russell, who would have a tennis ball for breakfast,lunch and dinner (not literally). Rocky is completely obsessed with his tennis ball and if he could, he would make you play fetch with you all day long. I sometimes call him Gollum (from the Lord of the Rings), cause he never wants to lose sight of the ball, and goes crazy if he cant find it! Then meet Ozzie (9 months old). If Ozzie wasn't a Jack Russell, I wouldn't have been amazed, because sometimes I think he's more of a bulldog (or any other lazy dog breed), than a Jack Russell! All he does is eat, drink and sleep. Oh and play if he feels he has the energy for it. He loves to eat, eat, eat. Very lazy, and twice the size of Rocky, even though Rocky is older than him!! They are truly opposite kinds, and would never think that they are actually the same breed! In the end, I love them to death, and gives me plenty of joy! 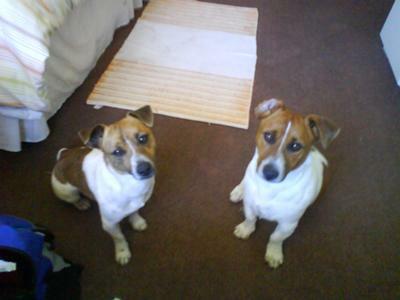 I love that picture of your JRT's, they are cuties. I have two JRT's as well. One is 3 and the other is a year old. They are both very different like you describe yours. My older one Yogi is the lazy of the two, preferring to nap and eat all day, and my 1 year old never stops! I love the fact that they are so different. It shows that some JRT's "can" actually be calm little dogs! Either way, I love them to death! Enjoy them, and have fun!